And then I thought, why yes...I probably SHOULD blog about it. So yes. 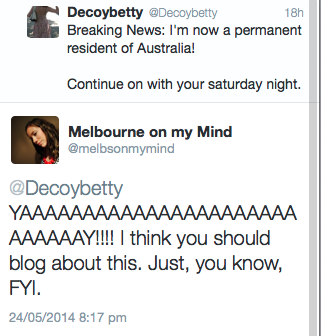 I'm now a Permanent Resident of Australia. It's taken since 2009 to make it happen. The last stage was frankly pretty easy. We presented immigration with further proof of Inspector Climate's and my relationship – invitations to weddings, plane tickets, etc. – we got statutory declarations from my Mother in Law and my old roommate. Kirsti from Melbourne on my Mind agreed to vouch for our relationship if immigration wanted to call her (did they call?). The most frustrating part of the process is that when you submit all the documents online the website automatically emails you to tell you that you "successfully logged in" but doesn't email you to tell you if you successfully submitted the application or if it was received. You press submit and literally NOTHING HAPPENS. Immigration...get on that. I can tell I successfully logged in because I entered the portal (oooh the portal), I do not need to be emailed for that. So, yes. I'm a permanent resident. And it feels good. Congratulations! It seems a bit low-key of the immigration to inform you of this via email, though. Surely fanfares and a pesonal messenger would be more apposite. Have you blogged about sobbing at the station and getting engaged? I'm intrigued and would love to read it. This is so amazing! Congrats. It also hits close to home, as yesterday my partner and I did some research on the defacto visa. I was really disheartened by the cost and amount of time it takes to receive one. I can't believe it took y'all sooo long! Nevertheless, I am so so so happy for you guys! It is ridiculously expensive. However it will not take you 5 years to receive permanent residency, it just took me forever due to the other visa I already had! Applying for a defacto visa immediately will significantly speed up the process! WOOT for you! Blogging kind of slows down when life kicks in, permanent like. ;) Miss your stories! Hooray! This is the best news! Congratulations to you! Yay that is so exciting, congratulations friend!